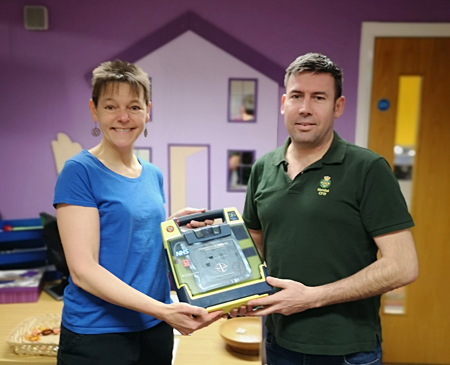 A BIG thank you to Kendal First Responders who have kindly donated a defibrillator to us for our new building to keep clients, volunteers and staff safer. Craig and Sandra Frazer from the group came to visit us back at Castle Lodge last year and when a new one became available they were pleased to be able to pass it on to us, saving us hundreds of pounds. Craig brought it in this week and reminded us how easy it is to use. All you have to do is make sure someone keeps doing the chest compressions while you call 999, pop open the box and follow the instructions! Let’s hope we never have to use it but we know what to do if we do. Thank you, KFR.